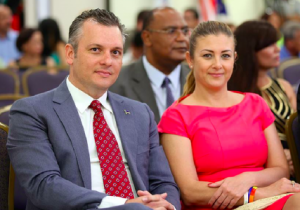 WILLEMSTAD - The Public Prosecution (OM) in Curaçao has again demanded a three-year prison sentence in the Court of Appeal against former Prime Minister Gerrit Schotte. If he is convicted by the court, Schotte must be detained immediately. Schotte is in court to defend himself against charges of corruption forgery and money laundering. According to the OM, he received money from the casino boss in Sint Maarten, Francesco Corallo. Schotte used that money for an election campaign. A judge sentenced Schotte last year to three years in prison, in accordance with the demand of the prosecution. Schotte immediately appealed and was able to remain out of prison pending his case. Now the OM demands his immediate imprisonment if he is convicted the Court of Appeal. Photo: Gerrit Schotte and his life partner Cicely van der Dijs.